In the decades since its invention, BOTOX® has helped millions of people all over the world achieve long lasting rejuvenation. Today, it’s widely considered to be one of the most popular cosmetic treatments of all time. It’s a reliable, incredibly powerful, and simple treatment. With just a few injections in a few key areas, BOTOX® can soften some of the most prominent and hard-to-treat signs of aging, more commonly known as expression lines. BOTOX® can effectively reduce lines in the forehead, frown lines in the glabellar area between brows, crow’s feet, vertical lip lines on the upper lip, and platysmal banding in the neck area. The main ingredient in BOTOX® is botulinum toxin, a protein that can be found all over nature. 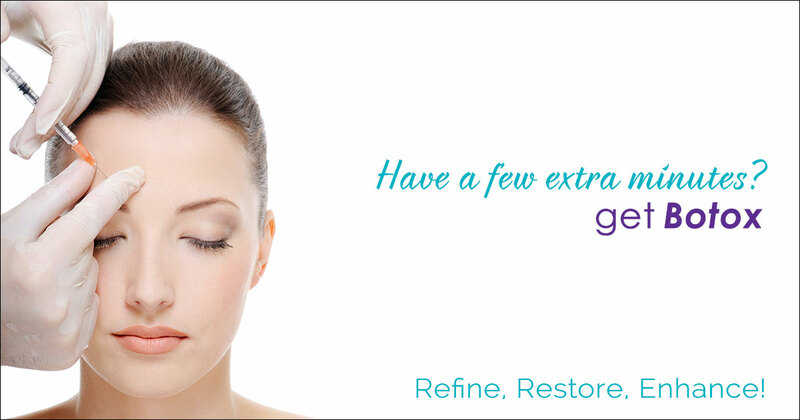 BOTOX® works by relaxing the muscles in our faces that create expression lines. Once these muscles have relaxed, the appearance of expression lines will soften. Your procedure will be meticulously planned so that you can get the best results possible. Each injection will be strategically placed to increase BOTOX®’s effectiveness. BOTOX® has an incredibly quick and painless procedure; on average, treatments tend to last less than a half an hour. Because BOTOX® is delivered using an incredibly fine needle, many patients report feeling only mild discomfort during the treatment. Ice or a topical anesthetic can be used to numb the treatment area before the procedure. After your treatment, your results should emerge in full around a couple of days to a week. You should be able to enjoy your younger, smoother skin for as long as 3-4 months. With BOTOX®, you can experience long-lasting rejuvenation with virtually no downtime. You will be able to return to work or school immediately after the treatment. It’s advised that patients refrain from laying down or rubbing the treatment area during the first few hours after the treatment. Patients should also delay exercise or other strenuous activity for the first 24 hours of their recovery. To avoid bruising, it’s recommended that patients avoid taking over-the-counter pain medication like Advil or Motrin immediately after the treatment. Chatham MediSpa is proud to provide one of the safest, most effective BOTOX® treatments in the country. Contact us for a BOTOX® consultation or our other medical-grade skin care procedures.